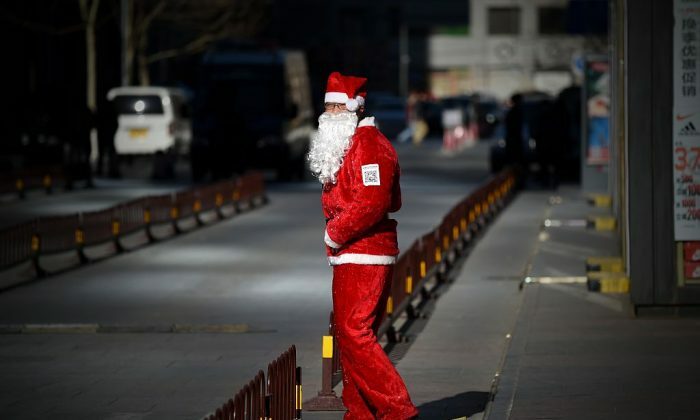 Add Santa Claus to the list of things the Chinese Communist Party (CCP) doesn’t like. With Christmas around the corner, the Party is wary of Western influence that it believes could corrupt the minds of young Chinese. At Shenyang Pharmaceutical University in northeastern China’s Liaoning Province, the school’s Communist Youth League, a Party organization for young people aged 14 to 28 to learn about Party ideology, issued an online statement, forbidding student unions, clubs, and youth league branches from organizing any activities based on Western religious holidays, such as Christmas, according to a Dec. 14 report by China’s nationalistic, state-run newspaper Global Times. Some netizens on Weibo, China’s popular microblogging website similar to Twitter, have expressed displeasure with the ban. The ban at Shenyang Pharmaceutical University is not an isolated incident. In December 2014, the Modern College of Northwest University in central China’s Xi’an City called Christmas “kitschy,” and banned students from celebrating the holiday. Students were forced to watch a three-hour screening of propaganda films instead, according to MailOnline. Also in 2014, the education bureau in Wenzhou City in China’s eastern province of Zhejiang, issued a directive ordering all schools and kindergartens in the region not to hold Christmas events, according to Radio Free Asia (RFA).